On Samos young refugee men from Algeria and Morocco are now being arrested and locked in the prison cell in the central police station. They are held there until it is possible to move them on to a locked detention camp on the mainland from where they will be deported. Police cells like the one in Samos town were never intended to hold so many people for days and weeks at a time. The conditions inside are beyond words. But not all those from Morocco or Algeria end up in the police cell. 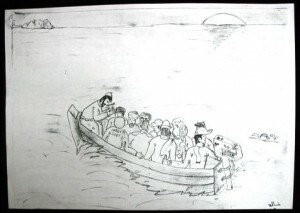 Most of them in fact are in the open detention centre with all the other hundreds of non Syrian refugees. At the moment it is a matter of chance if you happen to be north African whether you end up being taken from the beach to the cells or to the centre. However, as we heard at the police station there is now an order from Athens and Europe that Algerians and Moroccans are to be detained pending speedy deportation. It is the lack of capacity, not a lack of will which appears to be the key reason why not all of them get locked up when they land on the Samos beaches. Even if there has been little mainstream comment or even attention to this latest development, the ongoing division of the refugees into separate categories which has been in place for some months with the Syrians being split away from the rest, provokes deep anger amongst the refugees. ‘What difference?’ we are asked again and again by non Syrian refugees. The slicing up of the refugees into different categories, usually by nationality and privileging some and not others is now common at border points along the route through the Balkans. The recent focus on north Africans looks to be one of the responses to the Paris atrocity with many mainstream commentators and politicians seizing upon historically impoverished and alienated north African communities especially in France and Belgium as being sources and refuges of ‘Islamic’ terrorists. Hence the imperative to stop any further increases in these communities. There is no evidence at all which supports any such linkage between north African refugees and terrorist activity in Europe. We are hearing more and more of these kinds of sentiments. Lies and gross distortions thrive on ignorance. Never do these propagandists engage with the targets of their hatred. Where are the voices of the Moroccans and Algerians who can tell us why they leave their countries and take the deadly risk of crossing to Samos in an over crowded rubber dinghy in the middle of winter? The stories we have heard are varied. But a common theme stands out: for the young poor of Morocco and Algeria “there is no life for us in our countries” as one Algerian told us this week. But unlike similar abandoned populations, in Greece for example, which has seen hundreds of thousands of young people leave the country in recent years, the young Algerians and Moroccans are trapped. Passports and visas are for these young people, impossible to obtain. But to stay often entails being drawn into crime as a means of survival and this they reject. To leave is not easy; in Algeria leaving without papers has been made a crime and if they are caught they face up to 2 years jail. But as we heard on more than one occasion when we discussed the dangers involved in their clandestine journeys to Europe “we’d rather die eaten by fish than eaten by worms.” And it has been revealing how often they tell us that it was their mothers who both applied the final push and gathered together some of the money and smart phones their sons needed to escape their homelands. Many mothers are clearly afraid for their sons should they stay at home. The Algerian refugees we meet on Samos, as with those we have met over recent years in Athens often stand out from the other refugees. Their greater confidence, determination and just a sharper sense of what this world is about, reflects we suggest their longer experience of clandestine movement. All kinds of Algerian networks function throughout Europe helping them both to move and to settle. It is a clandestine world in which Algerian young people have been active in its construction and its sustainability. They are rarely passive victims. Ibrahim, who we met in the Samos centre three weeks before Christmas exemplified this spirit. This was his second visit to Samos. His first being in 2007 when he moved on from Samos to France where he lived for over 7 years before he was caught and deported back to Algeria. Now he was back and off to France again. Despite the borders closing in on him in the countries blocking his route (and the group he was traveling with) he was completely confident that they would make it. And so they did. Seven days after leaving Samos, they were all in France. This targeting of Moroccan and Algerian refugees has to be stopped. The right to travel is one of our most basic rights. It is a taken for granted right by the vast majority of citizens in the rich world of Europe, North America and Australasia. There are no grounds to justify withdrawing this right from Algerians and Moroccans or indeed anyone. Its implementation can be nothing but cruel. Moreover, as with all other divisive practices and policies towards refugees it distorts key truths about the nature of the current refugee exodus. Looking down and demonising the victims never gets us to the truth which lies up stream at the doors of the powerful for whom plunder and greed are their watchwords. Where war is not a matter of human suffering but the source of fabulous wealth. The key agencies responsible for managing the refugees coming through the Greek frontier islands were thrown into chaos and confusion by the 2015 exodus. Now half a year later we are beginning to see the authorities regroup and try and regain control. One aspect is the clear division of tasks between the big NGOs which have arrived since Autumn 2015 and the state agencies with the former responsible for meeting basic food and shelter needs of the refugees and the state agencies focusing on data collection and processing. But this relationship is not easy nor by any means unproblematic as the Greek authorities are jealous to maintain their control of what goes on in their country. The fractiousness which characterised this relationship is not likely to go away soon for the central authorities of the EU have determined that tightening up the EU’s external borders, especially the Greek islands is a priority. This will not be left to the Greeks to manage. We listen to the young Algerians and Moroccans coming to places like Samos. We insist that their voices are heard and broadcast in the popular media. They are a powerful the antidote to the viruses of hate which are being actively promoted by many politicians and commentators. On Samos the locals would be appalled and outraged to be called free loaders and parasites when they leave to find a life which is denied to them here today. This is just as true for the Algerians and Moroccans. What has the world become that we need to make this point at all? 2. Hamza Hamouchene,October 2013, ‘Is Algeria an Anti-Imperialist State?’ from http://www.jadaliyya.com/pages/index/14455/is-algeria-an-anti-imperialist-state. Hamza is an Algerian activist and a founding member of Algeria Solidarity Campaign (ASC), a London-based organisation campaigning for peaceful democratic change and the respect of human rights in Algeria.